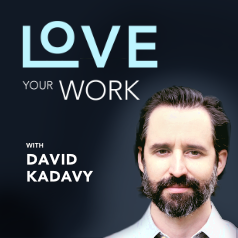 For this very special 100th episode of Love Your Work: How do you find your calling? I’ve been trying to get to the bottom of this over the past two years, and I think it boils down to a three-step formula that I’ll present in this special episode. To find your calling, you need to discover what it is you want to pursue. Usually, it seems, you don’t just wake up one day and know what it is you want to do. It can come from different sources. If you’re going to find your calling, you need to decide to pursue it. The chance of success needs to be more compelling than the alternatives. Once you’ve discovered your calling, and you’ve decided you’re going to pursue it, you have to actually do it. But how do you break through all of the fear and distractions to make it happen.